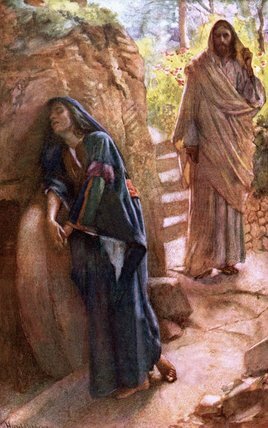 Early on the first day of the week, while it was still dark, Mary Magdalene came to the tomb and saw that the stone had been removed from the tomb. 2So she ran and went to Simon Peter and the other disciple, the one whom Jesus loved, and said to them, “They have taken the Lord out of the tomb, and we do not know where they have laid him.” 3 Then Peter and the other disciple set out and went toward the tomb. 4 The two were running together, but the other disciple outran Peter and reached the tomb first. 5 He bent down to look in and saw the linen wrappings lying there, but he did not go in. 6 Then Simon Peter came, following him, and went into the tomb. He saw the linen wrappings lying there, 7 and the cloth that had been on Jesus’ head, not lying with the linen wrappings but rolled up in a place by itself. 8 Then the other disciple, who reached the tomb first, also went in, and he saw and believed; 9 for as yet they did not understand the scripture, that he must rise from the dead. 10 Then the disciples returned to their homes. 11 But Mary stood weeping outside the tomb. As she wept, she bent over to look into the tomb; 12 and she saw two angels in white, sitting where the body of Jesus had been lying, one at the head and the other at the feet. 13 They said to her, “Woman, why are you weeping?” She said to them, “They have taken away my Lord, and I do not know where they have laid him.” 14 When she had said this, she turned around and saw Jesus standing there, but she did not know that it was Jesus. 15 Jesus said to her, “Woman, why are you weeping? Whom are you looking for?” Supposing him to be the gardener, she said to him, “Sir, if you have carried him away, tell me where you have laid him, and I will take him away.” 16 Jesus said to her, “Mary!” She turned and said to him in Hebrew, “Rabbouni!” (which means Teacher). 17 Jesus said to her, “Do not hold on to me, because I have not yet ascended to the Father. But go to my brothers and say to them, “I am ascending to my Father and your Father, to my God and your God.’ ” 18 Mary Magdalene went and announced to the disciples, “I have seen the Lord”; and she told them that he had said these things to her. Oh how long the travel to this day! This day and, in our Bible story, this garden. In real time, it was about 33 years. In the time of the church year, our travel began with awaiting Jesus’ Christmas birth. We wandered with him through his life’s ministry and followed him when he turned toward Jerusalem, toward his death. Some of us have spent the last 6 weeks of Lent walking the journey to the cross with Jesus – listening as everyone who knew Jesus, drifted away from him in denial and fear. Listening to those stories became reminders that those people who left Jesus to face his death alone and those who killed him could just as easily have been us. Oh how long the travel to this day! This day when we enter the dark, pre-dawn garden with Mary Magdalene – her eyes dried out from crying, her mind moving slowly through that cloudy haze of grief, and her body exhausted by lack of sleep – and the wondering continues about what just happened to all that she thought she knew…only to be shocked once more. Jesus is gone. Not simply dead on a cross or in a tomb, but, literally, gone. He’s not where he was supposed to be – similarly to how he wasn’t supposed to be dead on that cross. Oh how long our travel to this day! In the light of day, we enter the Easter garden here, in this church, among these lilies. Desperately trying to make sense of our lives and the lives of those we love. Trying to figure out the next right thing to do about the work, the layoff, the diagnosis, the break-up, the rejection, the loss…trying to figure out where to turn up next…trying to figure out where to be. And, here we are, this day, in this Easter garden. Oh how long the travel to this day! Mary realizes that Jesus isn’t there, runs to tell other disciples, who rush over to see the same thing, and confirm that, indeed, Jesus is not there! One of the disciples even sees and believes. But…pause here with me…the story tells us that seeing and believing did not bring understanding to this disciple about what is happening. At that moment, no one at the tomb in the garden expects it and no one at the tomb in the garden understands it. Oh how long our travel to this day! The pace of the world, the ridicule from enemies, the condescension from friends, the smorgasbord of beliefs, the cultural chaos, leaves us yearning for understanding – an understanding that incorporates enlightened thought and sophisticated argument; an understanding that helps us explain how we move from an empty tomb to expecting to meet Jesus in the world, now, today. Oh how long our travel to this day! Just when we thought it was safe to go into an Easter garden, we discover that what happens in the garden changes us, changes what we thought we knew about how the world works, changing what we know about how God works. Oh how long the travel to this day! As Mary now knows that Jesus is raised from the dead, she now knows that there is life after death and hope in despair. Called her name by the risen Christ and sent to tell the story, Mary the Apostle, sees the world through eyes that know the worst…yet trust in an ultimate outcome that she simply has no control over. Oh how long our travel to this day! Even as we gather here this Easter day, we bring our own confusion or despair or fear or hope to the garden – we bring ourselves. We wonder where Jesus is and who has hidden him. We might even prefer that he stay gone – after all, what might it mean if the dead Jesus didn’t stay dead? We wonder if the tears and fear in our own lives will ever be, or even wonder if they can be, met by the risen Christ. On this day, when we proclaim that “Christ is Risen Indeed,” we join Mary in being named by the Risen Christ as people who so desperately need him. Oh how long our travel to this day! This Easter day when Christ invades our despair. This Easter day into which Christ infuses hope anew. This Easter day when Christ calls your name. Please say it with me… Christ is risen! He is risen indeed! Alleluia! apostlediagnosisEaster GardenEmpty TombGardenergood cryHarold CoppingHow Long?JesusJohn 20:1-18lay offMary MagdaleneMary Magdalene at the SepulchreMary Magdalene the Apostleresurrectionrisen lordwhy are you weeping? Pick a spot, any spot, in Jesus’ crucifixion. There are many places to sit, stand or lie down. We can betray, deny, judge, rant, abandon or despair. Go ahead, pick a spot, because those characters are us. Those characters who run amok and rail against Jesus, ridicule him, or despair in his death are us. The irony of being a part of this cast of characters is that the person who hangs on the cross is the precisely the one who saves us. Jesus was tried, crucified, dead and buried. In every way that the cross could be offensive, it does indeed offend. It offends the sophisticated thought of modern people to think that the cross, and Jesus hanging there, was necessary or effective in any way. That we even need saving offends our enlightened sensibilities. That this appalling execution can change anything about real life seems at worst a massive deception and at best an utter folly. And yet, alarmingly, and quite surprisingly, it does. Jesus death on the cross changes everything. Jesus insists, time and again in the gospel, that God and Jesus are one. Jesus is in God and God is in Jesus. Think on this for a moment. How might God go about getting our attention? What are all the ways in which that may have been possible? God, at some point, needs to grab us in ways that we might have some shot at understanding. God needs to speak in human terms. When we hear of someone who dives into a raging river to save someone from drowning, saves that person but succumbs and dies in the flood waters, what are our first thoughts? What kinds of things do we say to honor the soldier who returns again and again to the firefight to save fallen friends? Wow! Spectacular save! How selfless! And on and on goes the praise and adoration. Earlier in the Gospel of John, Jesus says, “No one has greater love than this, to lay down one’s life for one’s friends.” After all, how much more can be given? In the Gospel of John as a whole, and in this reading from John on this Good Friday, Jesus is aware and focused on the goal of bringing people back into relationship with God. Somewhere along the way, as human creatures we lost our way. Rather than living into the image of God we became much more interested in placing ourselves in the center of things and holding God to the outskirts, leaving us free to make God into whatever image we choose – distorting God. It is in that re-creation of God that we are separate from God, powerless to repair what has happened. This separateness, this breach, this distance between us and God is called sin. Out of that separateness, that breach, that distance, that sin, comes all the ways in which we hurt each other and ourselves; inflicting sins against each other, ourselves, and God. Not only does Jesus draw us into relationship with God through the cross but Jesus redefines our relationship with each other at the foot of the cross – standing with the cross between us, Jesus intercedes for us on each other’s behalf. Drawn back into the relationship with God our Father, Jesus the Christ turns us towards each other in new ways. Here, at the cross, love is freely taken up for us and for the sake of the people standing next to us. In the same moment we have everything to do with what happened at the cross and we have nothing to do with it. Dietrich Bonhoeffer, Creation and Fall, (Minneapolis: Fortress Press, 2004), 113. This is a great text for deepening into the theological reflection on the “The Fall” that breached God’s intention for the creature as imago dei, in the image of God. My son left. MY SON LEFT! He told me he wished I were dead, asked for his inheritance and took off. I don’t know if he meant it but it doesn’t much matter one way or the other. His heart was set on leaving and maybe giving him the money meant he would at least get what he needed to live. He’s always been so tough, so stubborn. Sometimes that worked for him and our household and sometimes it didn’t. And he was never sure if I loved him as much as his older brother. What is it with these kids that my love for them is the constant question? Well, I suppose once he left, walked away as if I were dead to him, that question was no longer the question. It ate me up at night, imagining all the things that could happen to him and not knowing if any or all of them were true. Night after night I’d flop into bed, exhausted by the day’s work only to lay flat and be exhausted by the tossing and turning and wondering about my son. I’m not sure how it happened but I must have slept because in the morning I’d wake up – scratchy-eyed and cotton-headed, but I’d wake up. I’d wake up, head to breakfast and be met by sheer joy as I sat with my other son who stayed and worked beside me day in and day out; so faithful and so good. He keeps the commandments faithfully and works hard as the head of the household. You see, when I figured out the inheritance, I divided it between them. Each of them received what I would have given them if I were dead. My friends thought I was out of my mind. It’s a little out of the ordinary but it works for us. I still work where and when I can but he figures out what happens next for our household. I love working side-by-side with him, living in the day-to-day with him. Laughing at the old jokes, praying the prayers of our ancestors, disagreeing about who should do what, working up a good sweat, arguing about plans for planting and harvesting, walking down to the river at the end of a long day – all of it wonderful. His faithfulness blesses me day-after-day-after-day. He mentioned his brother from time-to-time. Wondered where he was, and wondered why he didn’t want to live here. I used to wonder why he didn’t go find his brother. I told him stories to try to clue him in. Like the time when David, our shepherd, went missing and then turned up a few days later with a wild story about finding one of his sheep he thought he’d never see again. I think he even kicked up his heels a time or two before he could settle down. Or the time when my sister, his Aunt Miriam, looked and looked and looked, practically turning the house upside-down, until she found the coin that she had lost. It took her days to find it and days to put the house back together after the looking. Truth-be-told we thought she was more than a little nutty at the time but we celebrated her find with her anyway. I told him these stories and more; and still, he wondered and worked and wondered. Not too many days ago, I was coming back outside after taking a break from the heat, and I saw someone walking up the road. It was one of those moments, maybe you know the kind, where my heart knew but my head couldn’t catch up fast enough so I just stood there, frozen, wondering if it was true. But I knew, I knew his shape, I knew his walk, I knew HIM! Before I could think any more about it, I was off like a shot! I only remember running as fast as I could; I think maybe I was yelling. I’m sure I was a sight – eyes wild, robes and dust flying all around, chickens scattering and squawking, I just simply couldn’t move fast enough. I practically knocked us both to the ground when I caught him up in my arms. I know he tried to tell me something but my pounding heart must have blocked my hearing it. I just knew we had to celebrate. That very moment became celebration and that celebration became a party – fatted calf and all! He wasn’t quite ready but we partied around him anyway. I think he was in shock. He was so hesitant, so timid. I still only know what happened to him in the bits and pieces he has been willing to share. I hope I hear more as he feels he can share it. His brother is also in shock. He couldn’t bring himself to be at the party that night. I went out to talk with him and he actually said something about, “This son of yours…” As if he had no connection to his brother at all! I did my best to reassure him of my love for him and explain the party for his brother. I told him, “Son, you are always with me, and all that is mine is yours. 32 But we had to celebrate and rejoice, because this brother of yours was dead and has come to life; he was lost and has been found.’” This wasn’t optional partying; this was HAD-TO partying. In the aftermath of all that has happened, here is what I hope my children know – deep down to their very toe-nails. I love them. I love them when they’re close and when they’re far away. I love them in their faithfulness and in their humiliation. I love them in their daily work and in their return. As inheritors of all that is mine, including my love, they are ambassadors of this household – finding whoever is lost from this house and bringing them to life again. For all of this and for more than there are words, I say again and again, thanks be to God!!! Those poor, poor Galileans. Those poor, misguided religious pilgrims who walked and prayed and sacrificed as they put one foot in front of the other to acknowledge the God of their ancestors as they put their faith into action. We can picture the earthy, rural Galileans laughing and crying with each other, with their families, while the rest of the city moves about its business. And, then, out of nowhere, comes Pontius Pilate. The villain extraordinaire, the ne’er-do-well to end all ne’er-do-wells – the Pharaoh to the enslaved Israelites, the Osama bin Laden to millions of people both living and dead, the shooter in Newtown to our beloved children and teachers. We can almost hear the hiss of the crowd as Jesus mentions his name. Jesus speaks to them with the well-known traumas of the day fresh on everyone’s minds. The people are pulsing with fear and survivor guilt as Jesus revisits the stories. 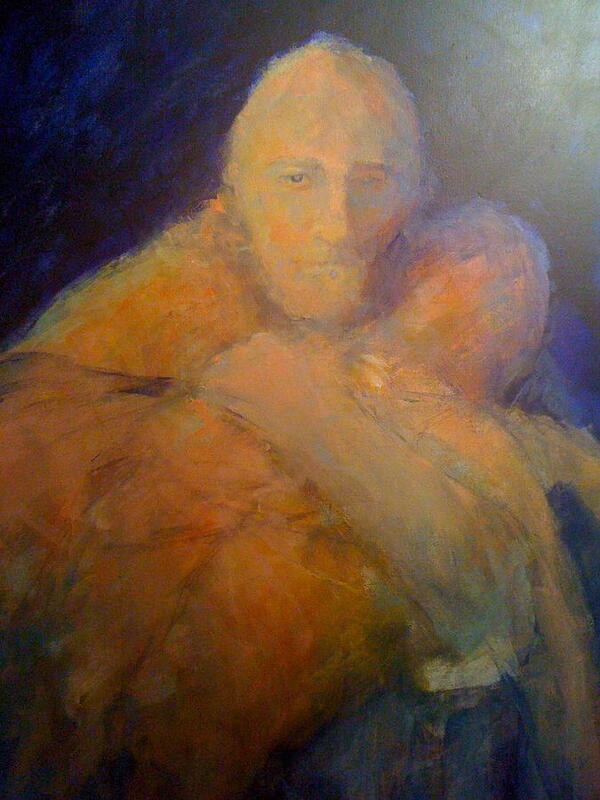 The people are looking for a comforting word – ears tuned, necks craned toward Jesus. And what does he do? He disappoints them. It’s important to note that what Jesus is doing here is separating the sin of the people from the calamities that befall people. There is no connection between the horror that Pilate inflicts and the sin of the people that he inflicts it upon. There is no connection between the Tower of Siloam and the sin of the people in the wrong place at the wrong time when the tower falls. 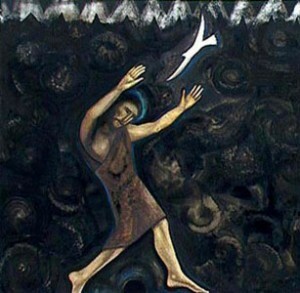 Jesus disconnects the sin of the people from the calamity that befalls them and, for all intents and purposes, tells the people to stop gawking in that direction. They aren’t going to find any good news about themselves through the misfortune of others. Nor are they going to find a God that is against others and, therefore, for themselves. God’s judgment is not doled out as calamities in our lives. Jesus is separating sin from calamity but Jesus is NOT separating sin from judgment. Judgment has simply been moved to a different place away from the punishment of calamity. Jesus says, “…unless you repent, you will all perish just as they did.” Hmmmm…“Just as they did…just as they did.” Jesus is separating sin from punishment and, in the same breath, he is comparing the people who are dead to the people who are listening to him. The comparison being that those who have died were unrepentant just as the people standing before him are unrepentant. They are unable to see all the ways in they work against God and work against each other. And until they can see this, acknowledge this work against God and each other, they are unrepentant. Perhaps this is where the fig tree can help us out. You all know this one right? The parable of the barren fig tree has to be in the, what, top five most favorite parables ever? Okay, so…no, not a well-known parable. But this parable seems to follow Jesus’ calamity stories as some kind of explanation. The vineyard owner is angry about a tree that has not borne fruit in three years and he wants to cut it down. The gardener stalls the owner’s anger and asks for more time for the tree. Take note that it is not more time for the same disappointing barrenness. This is not a stay that delays an inevitable execution. The gardener promises to tend this tree with fertilizer, giving it the chance to bear fruit, fruit that is worthy of the repentance from which it springs. The people to whom Jesus is speaking are called out. They are called out as unrepentant. In the Psalmist’s words we sang earlier, they are called out as dry. Today, we are being called out as well, called out as dry as the barren fig tree. Repentance begins in this moment of being called out. A word comes from outside ourselves and reverberates with truth as it moves inside. There is nowhere to hide from the reality in us that is being named; the reality of the ways in which we move away from and work against God and each other, the reality of our sin. This is one of the reasons why speaking out loud the confession and forgiveness when we gather for worship feels like air to some of us. Not by way of shaming but by way of naming, we confess and are brought together in the light of truth – the truth about ourselves, our need and our God. Being named for who we are and what we have done is called judgment. And as we listen to Jesus in the text today, Jesus very much connects sin and judgment. This, of course, is totally fine when it’s someone else’s sin that gets questioned or named or judged. It feels more than a little difficult when it’s our own. During the Apostle’s Creed we name Jesus as the one who will come again to judge the living and the dead. This isn’t a far off threat. This is a promise here, in the moment of now. We speak these words in spite of the bad rap that surrounds the notion of judgment. Quite possibly one of the worse things to be labeled is “judgmental.” And, yet, it is exactly judgment when God names something about us that is true, something we are in no rush to confess about ourselves. It is God’s judgment that convicts us and draws us to the surrender of repentance. And it is at that point where the gardener nourishes us. This is a moment when the whole creed becomes so important. Because then what do we say together? We believe in the Holy Spirit, the holy catholic church, the communion of saints, the forgiveness of sins…wait, wait a second now, what was that…the forgiveness of sins?! God judges and God forgives. God judges and God forgives in the proclamation of forgiveness. God judges and God forgives in the waters of baptism. God judges and God forgives in the bread and wine from Christ’s table. God judges and God forgives in the reconciliation one to another in this body of Christ, this church. God judges and God forgives as the one who resuscitates us and births divine love in our lives. Nourished here, in this place, by this God so that our lives are a testament to the one who sustains us. Nourished here, we can then bear the fruit of Christ in us, serving our neighbors – for the sake of our neighbors and for our own sake as others turn to serve us.